Hello, readers! I have decided to expand my toy blogging universe beyond my weekly Funko Friday series by providing a glimpse into the rest of my continually-growing cache of action figures and other collectibles. 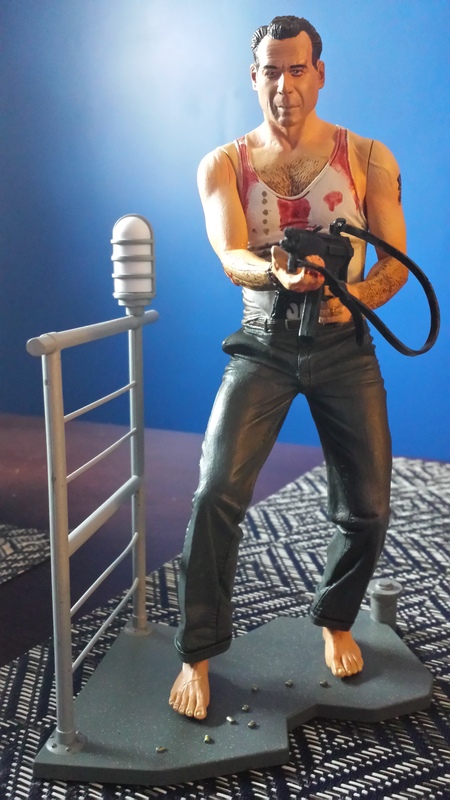 What better way to start than by showcasing one of my favorite action figures, which is none other than John McClane from the Die Hard series of movies! Played by Bruce Willis in the five Die Hard movies so far, John McClane is a New York police officer who always seems to find himself in the wrong place at the wrong time (always when terrorists happen to take over something, such as an office building, a plane, a city, or the Internet), but always manages to save the day. I grew up watching and loving the first three movies, because while McClane was an action hero, he was an “everyman” first – not roided up, didn’t go looking for trouble, and genuinely wanted to help people when the bad guys came to town. I had never seen the John McClane action figure when I pulled it out of the bottom of a dusty box in the back of a toy shop on one of New Jersey’s boardwalks. The cardback and packaging were bent, discolored and dusty – this brilliant likeness of one of my cinematic heroes had been just about forgotten. 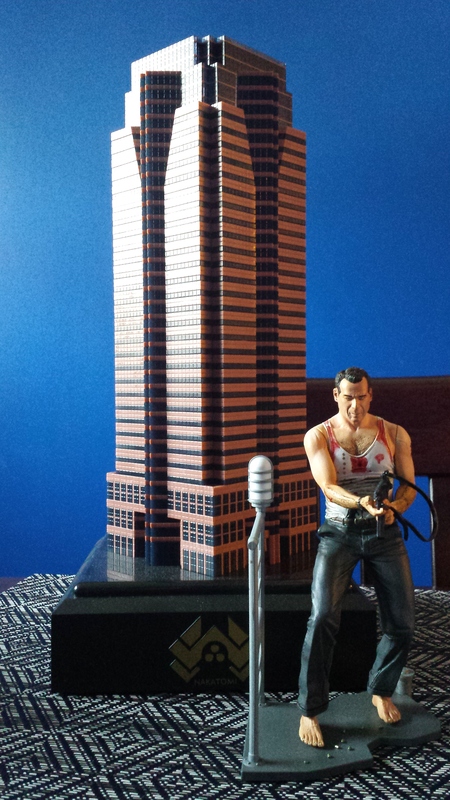 The figure depicts John McClane as he appears in the first movie of the series, barefoot (“fists with your toes”) and wearing a bloodied, dirty wife beater t-shirt as he battles Hans Gruber and his not-so-merry band of European terrorists who have taken over his wife’s office building in Los Angeles. 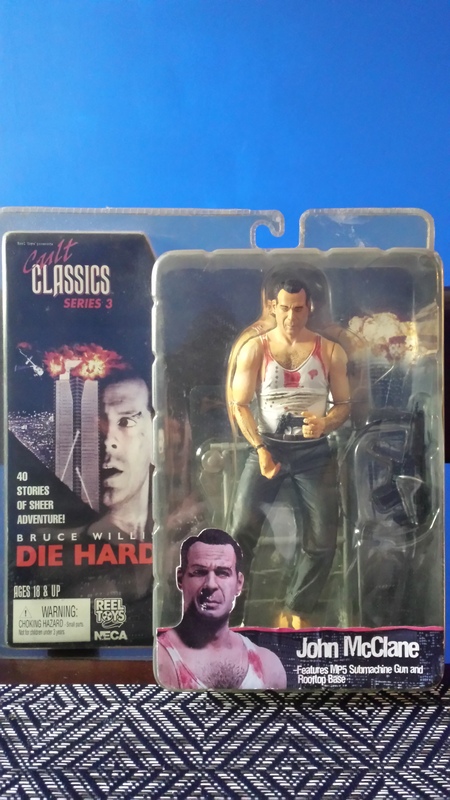 The action figure comes complete with a submachine gun that McClane cadged from one of the baddies that he killed, and even features the tattoo he has on his left arm, and the checkmarks and names of bad guys he writes on the inside of his right forearm as he picks them off. Created by NECA and Reel Toys, the detail on this figure is fantastic, perfectly capturing his likeness as he’s being fired at by angry villains on the rooftop of the building. To make this even better, my friend Cory bought me the Die Hard Blu-Ray box set for Christmas, which came with an awesome replica of the Nakatomi building where the first movie was set. I normally don’t do this, but I decided, based on the condition of the package and my desire to display the figure alongside my new Nakatomi Plaza replica, to remove Mr. McClane from his plastic prison. With such great detail, it is only right that he should be freed from the cloudy, scratched box. So it is written, so shall it be. The only thing missing now is a Hans Gruber action figure. We’ve always needed one, and now that Alan Rickman lost his battle to cancer, the call is only stronger for just a small piece by which to commemorate his brilliance. This has been the first dig into another section of my toy chest, and you’ll be able to find more in the coming months here at The No Seatbelt Blog!